Designed by Swizzle Stick Studio for Studio E, this cotton print collection features adorable koalas and other Australian animals. Perfect for your little one's nursery, quilting, apparel, and home decor accents. Colors include yellow, green, orange, blue, shades of grey, black, and white. A beautiful addition to any baby nursery. 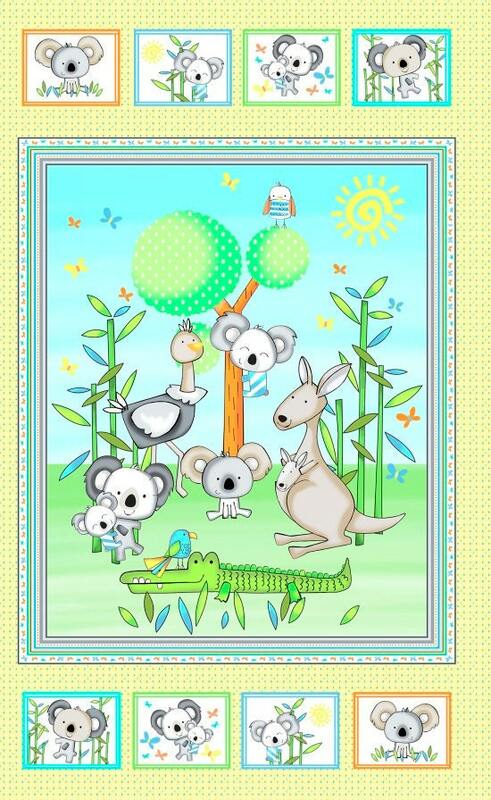 Such sweet Koala Bears, Crocodiles and Parrots to brighten up any nursery. Team this fabric panel up with the coordinating prints and you will have a fun quilt in only a few hours. All fabric from The Quilted Nursery Fabric Store is cut directly from the bolt and may be ordered in increments or continue yardage. Same day shipping always! Click on the link below to down load a free pattern from Studio E!